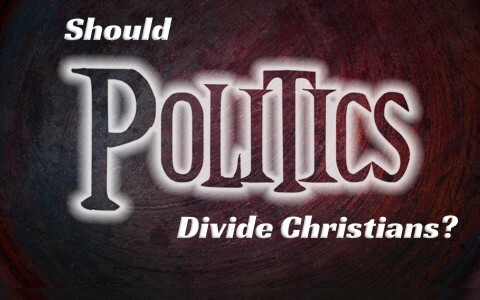 Should Christians divide over politics? Should Christian Democrats and Christian Republicans be at odds with one another? Is God Democrat or Republican? I have heard people actually say that they believe that God is a Republican because that party is pro-life but is God into politics? Should Christians be into politics? Should we campaign or put signs in our yards? What guidance from the Bible can we find in the realm of politics? The Pharisees and the Herodians were naturally opposed to one another but they had a common enemy and so they joined together against Jesus Christ and “sent to him some of the Pharisees and some of the Herodians, to trap him in his talk. And they came and said to him, “Teacher, we know that you are true and do not care about anyone’s opinion. For you are not swayed by appearances, but truly teach the way of God. Is it lawful to pay taxes to Caesar, or not? Should we pay them, or should we not” (Mark 12:13-14), but as always, Jesus knew their motives were less than honorable and “knowing their hypocrisy, he said to them, ‘Why put me to the test? Bring me a denarius and let me look at it.’ And they brought one. And he said to them, ‘Whose likeness and inscription is this?’ They said to him, ‘Caesar’s.’ Jesus said to them, ‘Render to Caesar the things that are Caesar’s, and to God the things that are God’s.’ And they marveled at him” (Mark 12:25-17). When it comes to things like government (Caesar) and the things of God, we are to render to each what is due them and be participants. That is, we should render unto political candidates our votes if they stand for our values like pro-family and pro-life. I cannot vote for someone who supports or promotes abortion. My conscience cannot allow me to do that. Sadly, most Christians vote at about the same rate as unbelievers do. Some Christians see voting as participating in this world’s system, but if Jesus said we are to be salt and light, does salt stay in the shaker or is light hidden under a basket (Matt 5:13-16)? It should not be so. We have every right to vote for someone who we feel reflects our values, and hopefully, they are biblical. Even so, like those who are not saved, a great number of Christians don’t go to the trouble to vote, even if they are offered the opportunity to vote for a pro-life candidate. Even so, if you voted for someone else, your relationship to me has not changed. The Apostle Paul wrote, “For just as the body is one and has many members, and all the members of the body, though many, are one body, so it is with Christ” (1 Cor 12:12). It is God Who has arranged each member of the body of Christ as He chose (1 Cor 12:18). God has placed each of us in one body so “that there may be no division in the body, but that the members may have the same care for one another” (1 Cor 12:25). Having different opinions on who to vote for should not change our relationship with the other members of the body. The hand should help the body just as the heart pumps blood to help the hand. They need one another and we all need the other members of the body to function properly for the work that Jesus has for us to do (Matt 25:35-36; Eph 2:10). If my brother or sister votes for another candidate than I do, I have no reason to become antagonistic against him or her. They don’t even have to tell me how they voted. It is not my business. I do vote for pro-life candidates, because to me human life is more important than the economy, homeland security, or the national debt. I’m neither a Democrat nor a Republican and not even an Independent. I am a follower of Jesus Christ and I want to be salt that penetrates those around me and a light to expose the darkness. That means I must do what I can and I choose to vote (among other things). I’m not saying that the economy or terrorism isn’t important. What I am saying is that life is so infinitely more important than the temporary things of this world. I don’t believe it’s good to associate ourselves as a Democrat or a Republican (or Independent), but as a Christian! We must not divide over politics. We might vote for one party or the other, but we should vote our consciences and not along party lines. We are not of this world, even if we are in the world (for the time being). Sometimes doctrine divides and that’s actually good. Christians must stand firm on the critical essentials (John 3:16; Acts 4:12; Rom 10:9-13; 2 Cor 5:21, etc. ), but Christians should not divide over politics. We have no reason to. Some might believe we should impose our views on others and make them see that voting for such and such a candidate is best for our nation, but this can only cause division among the members of the body. Jesus is the Head of the Church and He will hold each member accountable for how they’ve treated one another. Remember when Jesus struck down Saul on the Damascus Road? Jesus said “Saul, Saul, why are you persecuting me” (Acts 9:4). Paul had never seen it that way. Obviously, Jesus means that when we persecute other Christians, we are really persecuting Him! That’s serious business my friends. When we attack fellow believers and become divided, we are trying to divide what God has intended to be one! We persecute Jesus every time we persecute a fellow believer, thus Christians should never divide over politics; or anything else for that matter. Related reading: Should Christians Vote? In my opinion, I think sometimes we get so wrapped up in it all that we forget that we are not electing a Pastor, but rather a government official. Therefore we are not getting an opportunity to select from candidates that always have Christian word views. The fact of the matter is that we live in a fallen world and it is difficult to find “just the right one” to elect. Keeping in mind our values and finding someone who lines up closest with them is the best that we can do. Arguing about it with others is a waste of time when we can be using that time and energy to tell others about the hope that lies within us. Thanks for writing the hard stuff! Thank you so kindly Pam. This was one of those that took me about 2 hours to write. Thanks for the encouragement. I believe you are right and wrong on this subject. You are right when you say we shouldn’t divide ourselves in politics, but you are wrong when you say we should not argue over the subject as of being right or wrong. We cannot not walk as one, according to the bible. Can two walk together when they disagree? The bible say no. So, if a person is a democrat and I’m a republican and we vote what we believe on a subject, we had better vote the same way if we are Christians, if not we cannot walk together as one. The bible says that. Now, according to the bible we cannot walk as one, this means we cannot worship as one, and we should always point out to our brothers if we think they are voting for the wrong agenda, for instance, voting for someone who is a homosexually and believes that is a lifestyle we as Christians should embrace. We have to point this out and that will cause us ” Christians” to go a different way. So you are wrong and right on this subject. Thank you Al. You say that we should argue? I don’t see Christians as doing this with Jesus’ support. When you quote “can two walk together unless they agree” isn’t “can two argue together unless they agree” is taking this verse out of context. Thank you for the reply. You know, as most people do, that most of the time all the replies go unnoticed. I may have used the wrong phrase. What I mean is that if two don’t agree, then there must be some argument somewhere or else they would not know they don’t agree. A good discussion would be the PC way of saying this. The Apostle Paul would not let one word go without making sure it is the right word. I believe we could say Paul, with the bible backing, Never ever let the wrong way get by without notice. He would take issue in a second if it was worth while. I cannot let something wrong go by and not take issue with it. We cannot be tolerant with wrong. If it hurts the devil feeling, then so be it. I will let those in the wrong spirit know they are wrong. If I don’t who will?? They may never, because of being PC correct, hear the right way. While we are talking I really don’t believe a “Christian” should have anything to do with politics. That would eliminate a lot of division between brethren. I have seen fights over being this or that, when both were wrong. Christians have enough to do with teaching people God’s word and let the secular world teach the other. Jesus said to let the dead bury the dead. He could only be talking about the ones outside of the Kingdom looking after each other in some matters. I believe you could apply that to poltics and other things also. I like the article on the whole and know you put a lot of work into your writings. Lets don’t get caught up in this tolerant attitude and forget its our duty to point out the wrong in this world. God Has done all He can do. Its up to us to carry on the work that Jesus started. Saving souls with the Gospel. Thank you for effort in this generation. He still speaketh tho being Dead. God Bless in your work of saving precious souls with the Gospel of Jesus Christ our Lord. Thank you my friend. I appreciate your input. I see that I misunderstood and so apologize sir. Your words are full of wisdom. I stopped attending a particular church when they had a national vote and decided to ordain homosexuals. I had a long discussion with the pastor and he basically told me I was committing the sin of blasphemy by stating that “Christians” who were practicing homosexuals should have no place in positions of authority in the Church. My position was that it just wasn’t because they were practicing homosexuals, it applied to anyone who embraced and celebrated a lifestyle of sin. So I divided myself from that fellowship and stopped attending. I also would stop attending a church which endorsed Planned Parenthood with their death mills killing the unborn. There are “Christians” I know and care for who attend such churches and I will not fellowship with them. I am cordial toward them and they know where I stand but I have divided myself from them. So, I understand the major premise of your article but there are exceptions politically speaking. Those candidates such as the current Democratic presidential candidate supports 100% gay marriage and Planned Parenthood. I do not understand how a person who calls themselves a Christian can support such a person. Do you really believe that Paul, Peter or James would condone fellowship with “Christians” supporting such people?? It would be like fellow-shipping with folks who were for offerings to Molech. That is what I liken Planned Parenthood supporters to, where the people would offer their children as burnt sacrifices. Would the apostles fellowship with supposed believers who supported such activity?? I don’t think so. Amen Doc. And thank you. Yes, I think we must take a biblical view because it’s God’s view that matters most. The point is well taken where many will profess Christ (Matt 7:21-23) but have never really possessed Christ thru repentance and trust in Him. God sees our love as being shown in obedience and “thou shall not murder” has so blood-stained this nations hands that we cannot do or say nothing. Salt preserves but it also stings the wounds and light overcomes the darkness but the light must get out from under the table or it is useless. Thank you brother.